PayPal has introduced a Facebook app that lets people—or businesses—send money to other users within the Facebook social network. The app, simply and appropriately named Send Money, gives users another reason to spend more time on Facebook. The Send Money app combines money transfers with ecards to enable people to wish people in their social network a happy birthday, or commemorate a new job, new baby, or other landmark event by sharing an ecard on their wall and sending a monetary gift via PayPal. It is also possible to just send money without having to send an ecard. 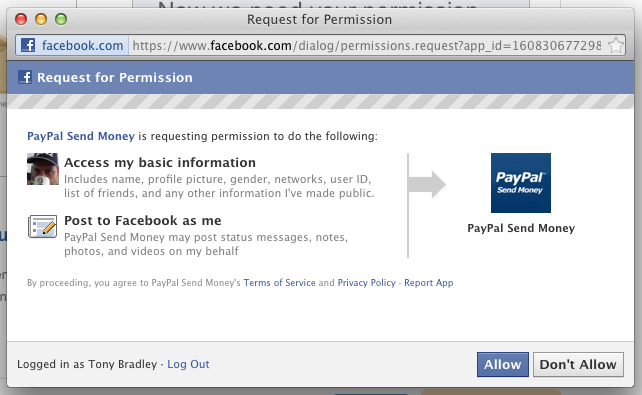 PayPal Send Money needs permission to access your Facebook account. It is a powerful combination. Facebook has over 800 million members with an average of 130 friends each. Half of those Facebook users spend time on the social network daily. Combine that level of activity with the fact that 80 percent of active PayPal members are on Facebook, and the stat from Hallmark that people send 500 million ecards each year, and it seems like a perfect match. On the one hand, sending cash with an ecard over a social network is not the most touching or thoughtful gift one can send. In an era of digitally downloaded music and ebooks, though, it seems to be a sign of the times. What Send Money lacks in personal thoughtfulness it more than makes up for by making it much easier to give gifts to people you might not otherwise consider giving to at all. For businesses, PayPal Send Money provides yet another opportunity to leverage a social networking presence on Facebook to engage with customers. A Facebook Page is already a great opportunity to build customer relationships and foster brand loyalty, and Send Money can be used to benefit both the organization and its customers. Customers who return goods, or are owed a refund for services can be offered the option to receive the money via PayPal. Businesses could use PayPal Send Money to transfer funds to customers for rebates. It is more efficient and cost-effective than mailing a paper check, and customers will appreciate receiving their money faster. Companies often pay small awards as incentive for users who participate in polls or surveys. As with rebates, these small amounts could be paid much faster, and with less expense by transferring the money via PayPal Send Money. PayPal payments made directly from a connected bank account, or using funds stored in PayPal are free. There is a small fee for payments made through other methods, such as with a credit card.